I saw this raccoon about twilight last night. He was walking the top of our neighbor's wall. 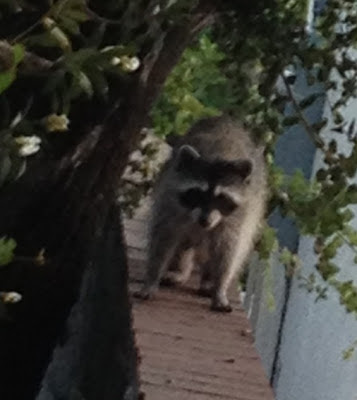 Prior to this year, I had not seen a raccoon in Pasadena. I know they live here, I just had not seen one. We're on the trail to Eaton Canyon Falls with a group of third graders. In route, we pass these painters dabbling in the cool of an old oak. They've got a vista to the canyon walls and a palate of color. If they want, they can drop in some school kids. The kids are on their way to the falls. And they have an assignment -- to pick up trash along the way. We leave the artists and break into sunlight. The trail swings back and forth across a winding stream and soon the whoosh of falling water is in the air. Cooled by a misty breeze we come face to face with 40 feet of falling water. Described by John Muir as "a charming little thing with a low sweet voice," this is Eaton Canyon Falls. Over the years, we've been to Eaton Canyon a lot. I can't step foot in the place without thinking of some past event, whether its carrying a kid on a trail, playing in the stream, watching frogs or just hanging out at the nature center. A few years ago, I did a pretty good post on a Hike to Eaton Canyon Falls. If you can't go on the trail, the post gives you a good idea of what you would see and hear. Back to the third graders. The kids had a great time. They scrambled over boulders, played in the stream and experienced nature's beauty in a hands on, soaking clothes kind of way. And they carried out their assignment. They were studying the environment and the effects of pollution. So, they picked up trash. What they found was amazing. Beer bottles, soda cans, plastic forks, plastic bags, potato chip bags and wrappers of all sorts. There was a full diaper someone left just off the trail. And door mats. Yeah, my daughter found two door mats lying in the stream. The kids filled three large trash bags, which we carried out. Mountains, water falls, doormats and diapers. It was a good lesson on nature's beauty, the truly stupid things people do to the environment, and the importance of protecting our forests and parks.